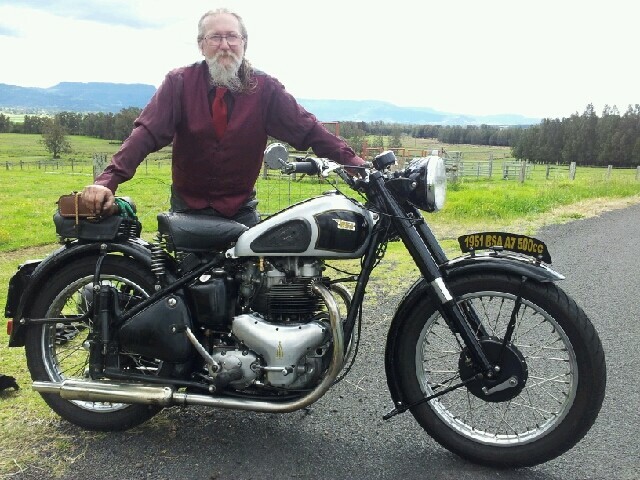 I am selling, on behalf of a mate, a 1947 A7 Longstroke project bike. It is 90% complete. I am seeking members input as what it is worth as my mate is just looking for a fair and reasonable price. And yes I know the old saying that it is worth what someone is willing to pay. I will post a full description with photo's in the new year but in the mean time if anyone is interested send me a P.M. The bike is in Victoria, Australia. Frame # XA7 1418. Engine # XA7 1872. Looks pretty original, love it! Bugga, too late for Santa's list and my lotto ticket was a dud. I'm a bit conservative when it comes to putting $ value on things but I'd guesstamate $3-4K AU. I'd be looking at throwing another $4-5K AU to get it reasonable. Oh bluddy'ell Musky, now you've ruined my pitch of A$1374.62. Thanks for your input Muskrat. I will work to your valuation of somewhere between 3-4K and see where we land. Everyone's input is appreciated and makes a valuation of the bike easier for all concerned. Your bike looks great, thanks for posting. I might have the correct lower fork legs for the bike for a successful buyer (only one stay bolt/lug each side, not two). A mate of mine owns one of the early long strokes, there are a lots of surprisingly subtle differences compared to the later bikes eg “flat” timing case, wider fork yolks, bigger dia headlight etc etc ETC. They are VERY nice bikes, rare as well. 3k Aussie $ seems fair, unfortunately with projects the value is more in the sum of the included rare parts, than as a bike to be restored. To restore it will cost $$$$$$, more than it will be worth, but who cares eh. The front forks had wider yokes as well as just the one mudguard stay bracket towards the rear so the front stay bent round the slider. The wider yokes were because the front wheel was QD as well as the rear and were interchangeable. Here is a picture of the correct sliders. Thanks for the picture John. There are another set of sliders with the bike which look like the correct ones. I will take photo's next week and update my post. I too will be interested in how it sells & valued. Yours is beautiful to me as full of promise & a challenge, but not everyone looks at a project that way. There is one locally here 47-48? Was at spring vintage club show & swap meet (Jumble) The seller was quite high on his price for our local market, But was a very complete bike in good condition (Albeit needing resto) and I took a lot of high quality detail pictures. I have downloaded them and created files but have yet to convert them in size to post. Meant to post up some reference pictures of the air cleaner and other special bits. Will soon but saying that for a while now. I love seeing old barn & shed finds however for best marketing and $$$$ you should clean it up and reshoot the photos. While very rare and desirable, the others comments is their is a VERY limited market of people willing to take something like that on. Many peoples idea of a restoration is swapping out rusty handlebars and detailing the bike. Price: One should NOT rely on blue book, NADA & to some degree Hagerty as they seem to be 30-40% wrong on avg but one example is a optimistic shop in the US prices a BSA B44 Victor Special as booking $15,000 so theirs was a bargain at only slightly less. You have to take a compilation of upper and lower end markets and factor in region. US differs widely in markets alone, But UK, OZ & NZ trend much higher in prices on older bikes like this. Value here in Oregon-Washington is much lower than Calif. In some states (now famously termed "Flyover states") the only thing that sells is Harleys and Dirt bikes and then Snowmobiles in winter.